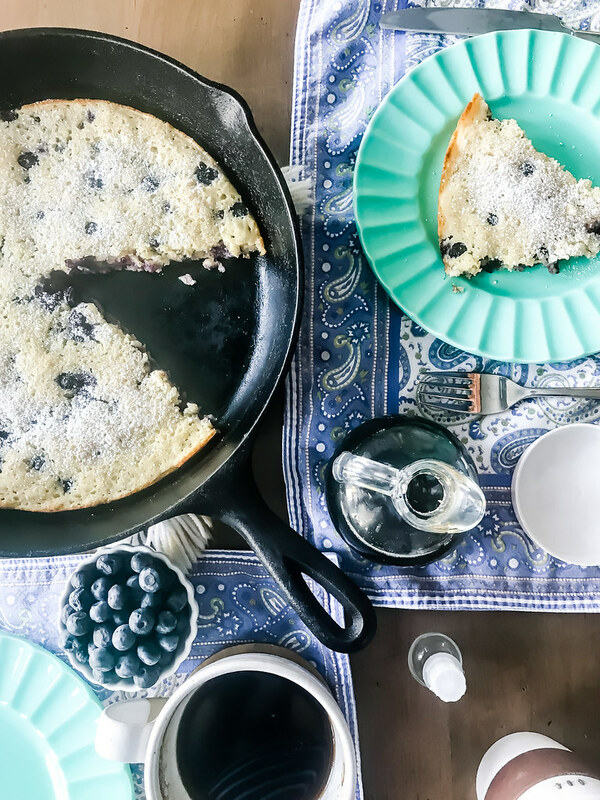 Blueberry skillet pancake: Put your hands together for one of the easiest weekend breakfasts you could ever make that will feed your entire family and keep those bellies happy. 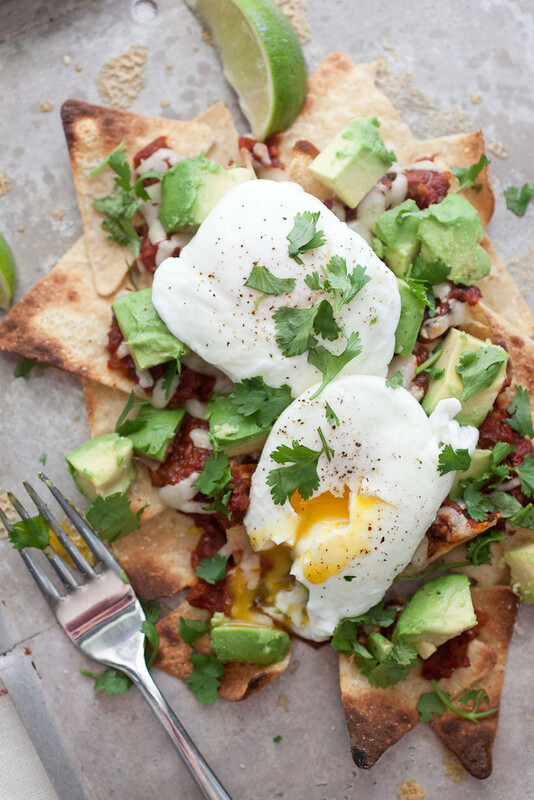 Who’s with me on quick and easy weekend breakfasts? Scones from the freezer? Come to mama! 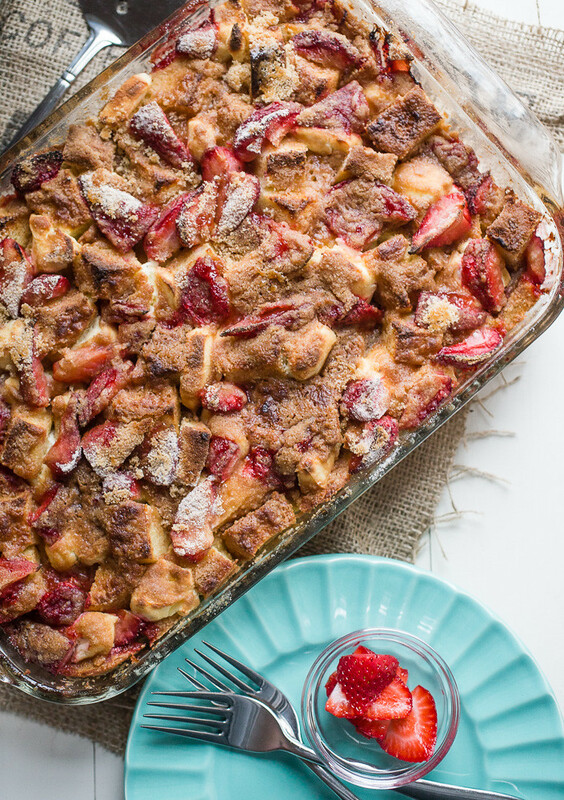 Make-ahead strawberry cream cheese french toast casserole? OMGYESPLEASE! Pancakes? Oh how I love pancakes! But oh how I also can’t take the mixing, pouring, flipping, and constant worry about the first batches staying warm while the last of the pancakes cook. 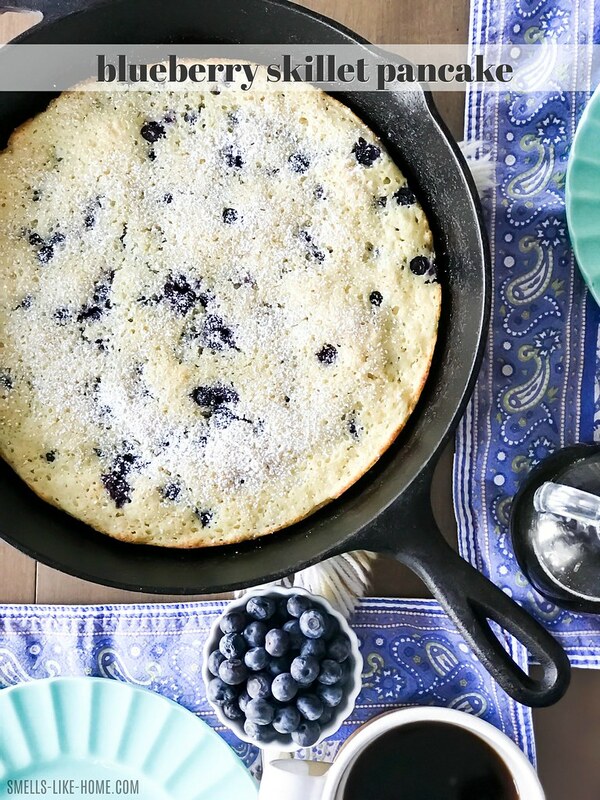 Enter this blueberry skillet pancake. Mix, pour, bake, eat. Everyone eats at the same time – a rarity on “pancake Sundays” when I was growing up – so a hot breakfast is guaranteed. And if you’ve got littles toddling around like I do, you’ll appreciate the fact that there’s no running in what feels like slow motion between a hot griddle full of pancakes and the babe who is just about to knock over the plant stand. 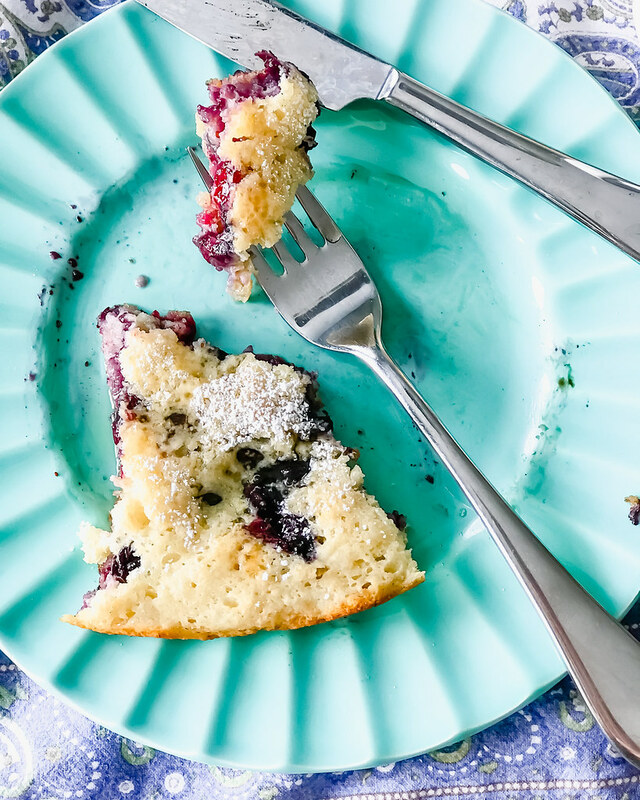 You’ll preheat a skillet in the oven while you quickly mix up the pancake batter and then bake a scattered blueberry batter for 25 minutes. BAKING A PANCAKE! I love this idea so much!! This will give you plenty of time to I don’t know…reheat your coffee for a 3rd time that morning. Or hand wash the poop stains from the baby’s brand new onesie because the diaper blew out again. Or put the babe down for a nap and pretend you have a quiet hour before she is mysteriously awoken by some phantom noise. ANYWAY. We haven’t yet fed this blueberry skillet pancake to Riley but it’s definitely on our near-future list. She’s loving blueberries right now and I can see her absolutely loving this pancake, especially since it’s the perfect kind of food for her to eat with her adorable little hands. 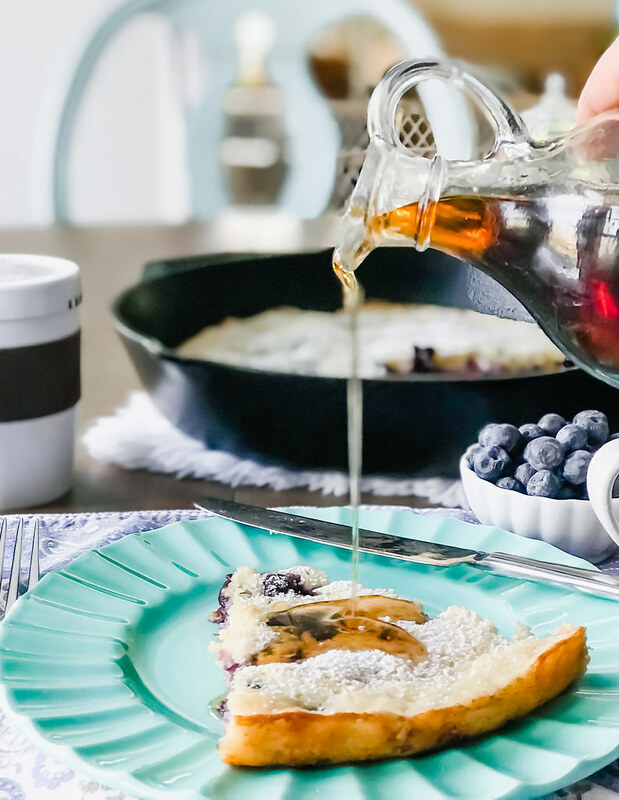 And we kinda went nuts over this blueberry skillet pancake! 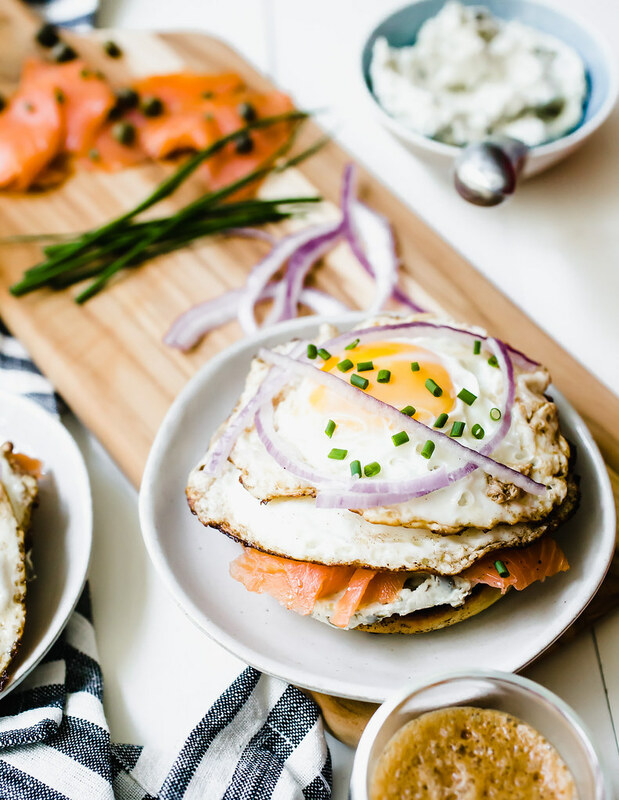 It’s sort of halfway between a muffin top and a pancake – not quite as dense as pancakes can be – and we completely loved it. Dusted with a little powdered sugar and drizzled with maple syrup, this pancake definitely hit the spot for an easy weekend breakfast. 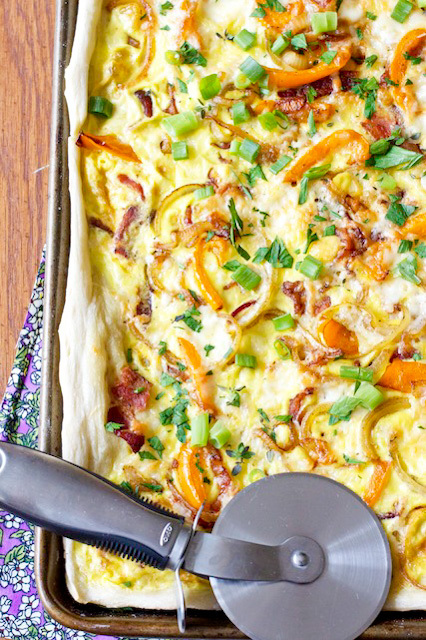 It’s also a delicious idea for a make-ahead breakfast since you can bake the pancake a few hours before you plan to serve it and reheat it in a warm oven! 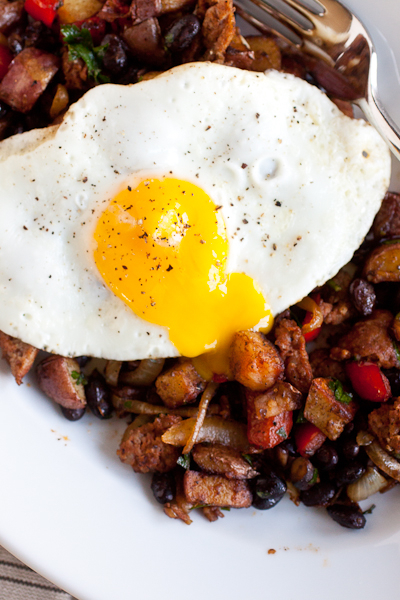 Looking for more easy weekend breakfasts? 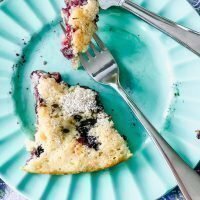 Blueberry skillet pancake is quite possibly one of the easiest weekend breakfasts you could ever make. It will feed your entire family, keep those bellies happy, and can host lots of different add-ins like chocolate chips! 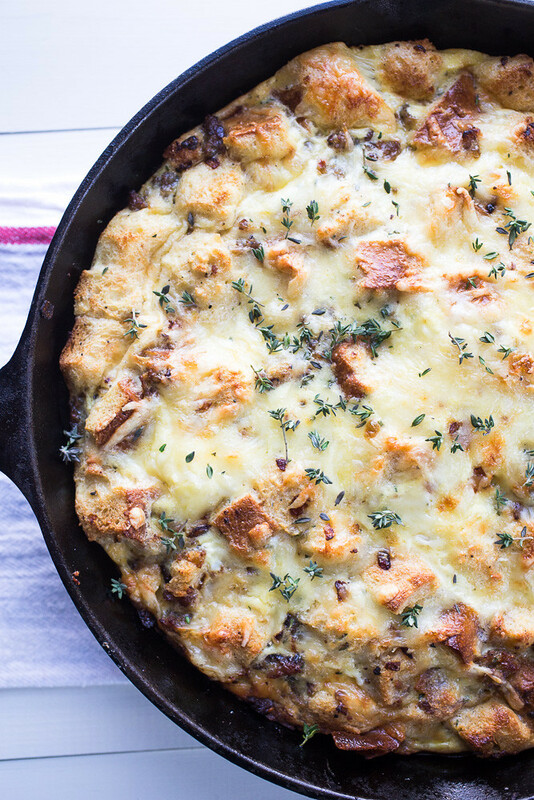 Preheat oven to 375° F with a 10- or 12-inch cast iron skillet in the oven while it preheats. Whisk the flour, 3 tablespoons sugar, baking powder, salt, and lemon zest together in a medium mixing bowl. 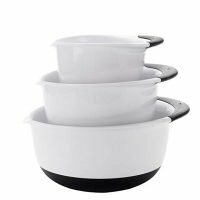 In a 2-cup liquid measuring cup or another medium bowl, whisk the buttermilk, egg, vanilla, and melted butter together. It may clump a little if the butter is too warm but that's ok. 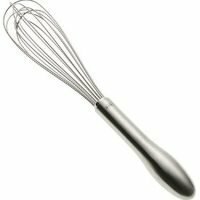 Mix the wet ingredients into the dry ingredients with a rubber spatula just until the flour disappears. Fold in ¾ cup of the blueberries. 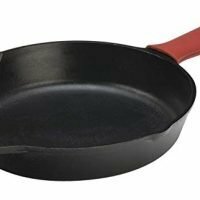 Carefully remove the hot skillet from the preheated oven and melt the remaining 1 tablespoon of butter in the pan and swirl it around the bottom and sides of the pan. Pour the batter over the melted butter and spread it out with the spatula. Scatter the remaining blueberries over the top of the batter and sprinkle the remaining 1 teaspoon of sugar over the blueberries and batter. Bake for 20 to 25 minutes, until the top is golden brown and the edges have just started to pull away from the sides of the pan. Cool for 5 minutes then dust with confectioners' sugar, slice into wedges, and serve warm with maple syrup.